Ever wonder what an ale drapper is? Where the word “abjuration” comes from? Or just who Angra Mainyu was? Well wonder no more. Alphabet Soup is a comprehensive guide to words commonly (and uncommonly) found in games or used by gamers. It provides quick, easy definitions in lexicon form: gaming terms, definitions, historical context, mythological terms. It even gives gamemasters advice on how they can use them in their games. It works like an encyclopedia of random bits, only these random bits are things I think are interesting for gamemasters. AND Like any encyclopedia series, the first letter is free. Flip it open randomly to discover that an Abambou is an African spirit of sickness, then introduce one into your games. 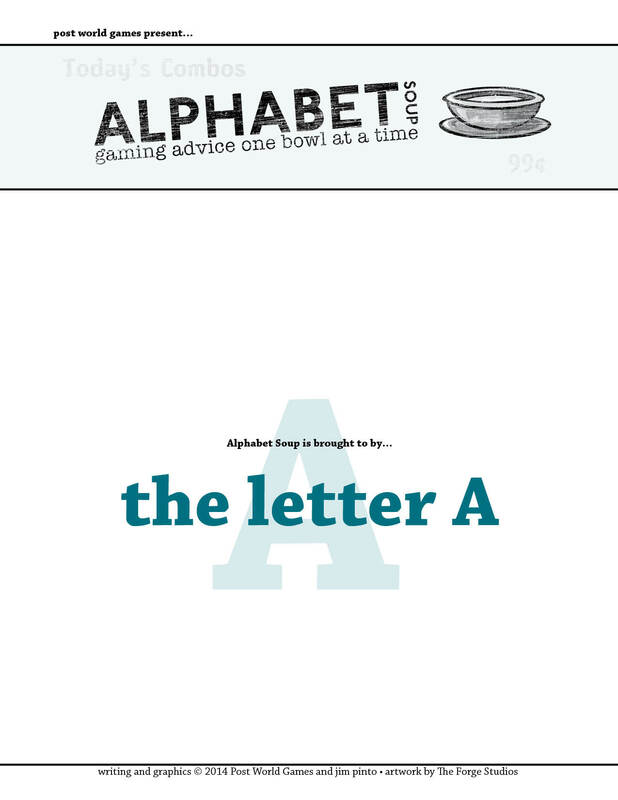 The letter A covers everything from Ale Conners to Albion the Giant; from Abracax to a rant about Alignment.